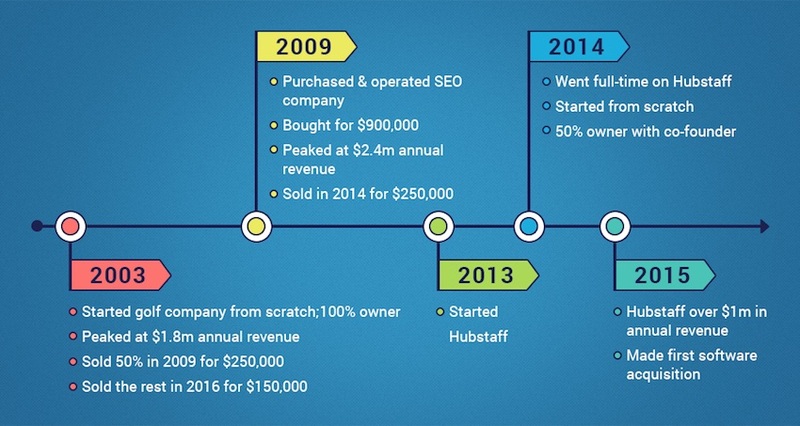 Content is one of the most effective channels for marketing Hubstaff. 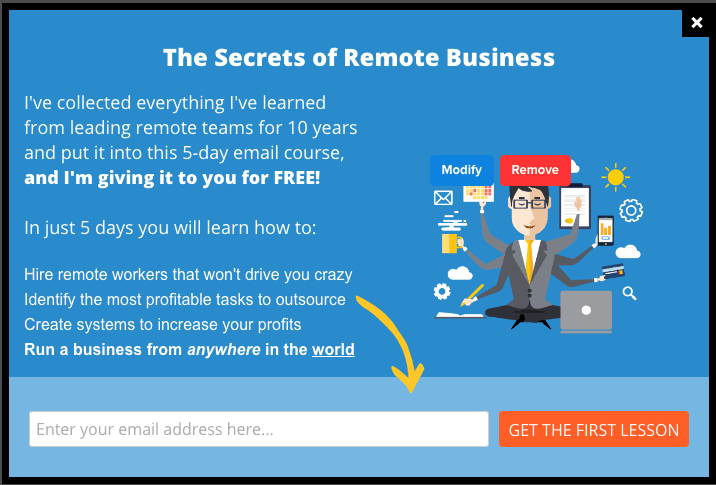 We use content to build an audience, convince our readers to try our software, educate people on how to use Hubstaff to manage their remote teams, and so on. A lot of our other marketing channels depend on our content to achieve their goals. That’s why it’s paramount to us to not only produce content on a regular basis, but publish material that is high-quality, engaging, and, above all, useful to our readers. As the manager of that channel, the utmost responsibility for getting our content to check all of the above falls to me. 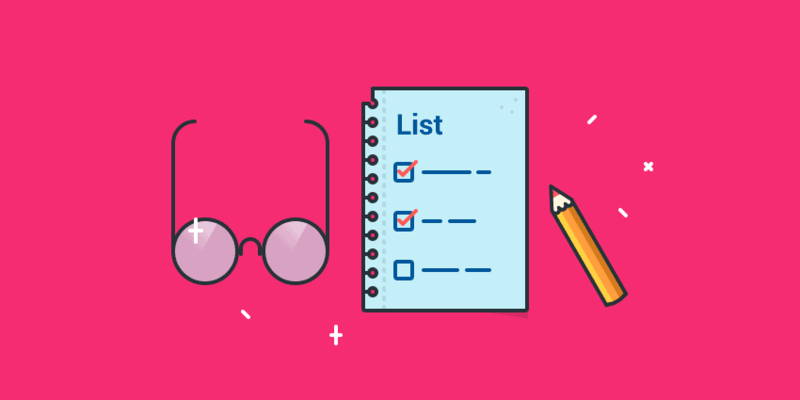 Over the last few months, I’ve developed a checklist that allows me to keep an eye on all the important features that help distinguish our blog posts in the sea of online content. 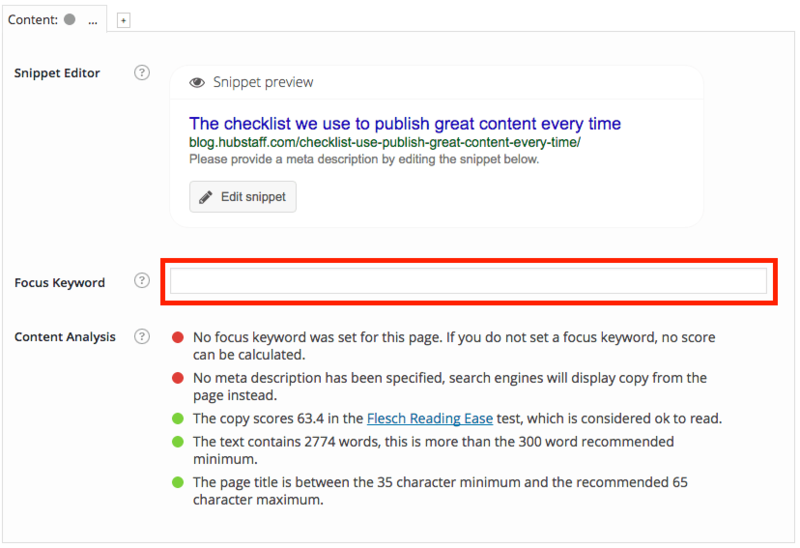 In this blog post, I will share the exact checklist and process we use to publish great content every time. Free Bonus: Get the checklist to use for your own blog or site: Download the PDF. Download the checklist and keep reading to learn how to set up your posts the right way. Often, we create content around a specific keyword in an attempt to rank well for it on Google and get traffic to our blog. 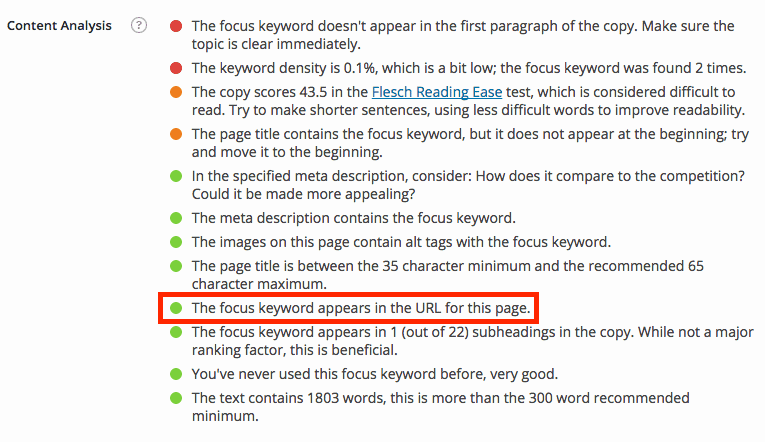 However, other times we write blog posts with a topic in mind and no clear keyword to optimize for. At this point, it becomes important to discover a good keyword to optimize the post for, in order to bring in organic traffic to our site. We use SEMrush for keyword research. The tool allows us to compare search volume and the difficulty to rank for that particular term (the higher the search volume, the harder it generally is to rank for a particular keyword). Once we choose a keyword for the article, I set the specific URL, making sure it contains the term we want to rank for. 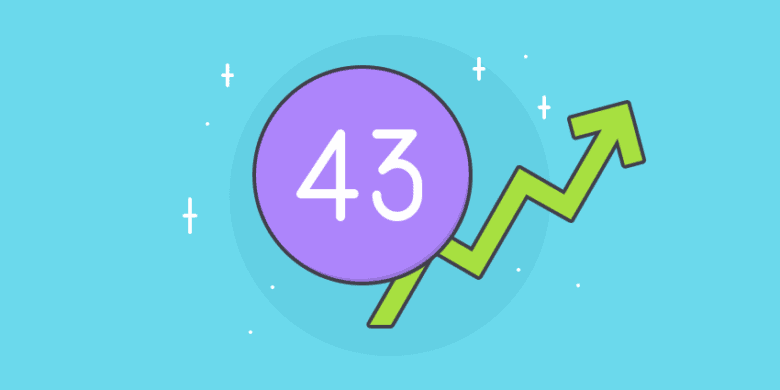 We also avoid using specific numbers and/or years in the URL’s – that way we can easily update our posts and keep them evergreen without changing the URL and losing the SEO benefit, backlinks, social media share counts, and more as an effect of that. Step 3: Is the correct author set for the post? We treat content as a collective effort at Hubstaff, and sometimes a single blog post is the result of a collaboration between several people on the team. However, one person has to be the official author of the article and that’s usually driven by what the topic is and who on our team is an authority on it. Moreover, we often have guest posts on the blog, making it important to keep an eye on the author field and make sure we have the correct person set as the author, along with their photo and bio. Step 4: Correct category set? In the past, we used to file blog posts under multiple categories. Since the re-design of our blog homepage, we’ve streamlined the number of categories we use and switched to filing each piece of content under just one category. Headlines are the most important feature on this list. Consider this: 80% of visitors will read your headline, while only 20% will read the rest of the content. Getting the title right is important to get a larger share of visitors to read the full article. Without it, no matter how good and useful our content is, it will go to waste. Above all, we aim to create a promise for our readers (for example, the title of this post promised you a structured approach to creating excellent blog content). The caveat here is that the content following the title should always deliver on that promise. We tend to use who, what, when, and how in our titles (ex. “How to hire a VA”), or even answer big questions in the headlines (ex.“The best freelance WordPress developers”). We use power words in our titles as they create an emotional connection. We use numbers because they’re easier to “consume” and they can also serve as a mental shortcut for our readers. For example, The 5 best time tracking apps for Mac users tells readers that they can quickly skim the article and find a solution, while 30 Best project management solutions signals a much longer (and extensive) piece of content and time commitment. 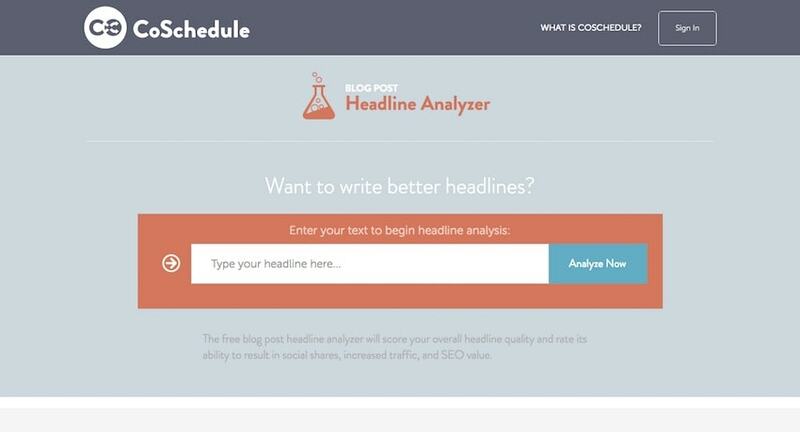 You can use CoSchedule’s Headline Analyzer to check your title, but as every automated tool, it should be taken with a grain of salt. If the title is the most important part of a blog post, the introduction is the second most important. There’s a popular saying among content marketers that goes “The goal of the title is to convince readers to read the first sentence.” Naturally, the goal of the first sentence is to convince readers to read the second one, and so on. That is what makes the introduction so important to the rest of the text. It has the power to make or break the reader’s conviction to read the rest of your blog post. Preview: finally, you give them a glimpse of what your solution consists of, thus making them excited to keep reading. It’s important to carry the positives from the title and introduction into the text body if you want your content to be successful. Write in short paragraphs and optimize for readability (your readers should get a good idea of the content even if they are just skimming). The golden rule is 1 idea = 1 paragraph. Going beyond, you can keep paragraphs short (1-2 sentences) and use formatting and visuals strategically to keep readers engaged. As with other things on the list, subheadings serve more than one purpose. On the one hand, they help readers keep track of the overall picture. One of the things I look for when editing text is whether a reader would be able to follow the “story” of the article and get the most important lessons just by reading the subheadings. Accept the fact that most people on the internet skim (no, they won’t make an exception for your content), and optimize your assets accordingly. The second purpose is to help with SEO. Subheadings are one of the factors search algorithms looks at when deciding what search terms (keywords) to rank your content for. This is a headline that works well on its own – you can navigate to the relevant section it’s heading and you’ll know what to expect there. This gives readers an easy way to navigate and find the information they’re most interested in – this serves our strategic goal of being helpful to our audience. A click-to-tweet (CTT) is a special type of call-to-action that urges readers to share a link to our articles on Twitter from their account. We aim to place at least 1 CTT per blog post, but depending on the length and the amount of good actionable advice, we could have more. As you can see from the example above, although the sentences that go into a blockquote are usually the most eye-catching part of the text, most of the time they need the rest of the text body for context. Does it make sense outside of context? Will readers understand the main point if all they see is the CTT? The easiest way to create a good CTT is to add the title of the post as the tweet text. We often do this with our first (usually only) CTT, which is placed at the end of the introduction. This is a trade-off between getting it seen by the largest number of readers (the deeper you go in the article, the more people leave, which means the end of an article doesn’t get as many views as the beginning), and increasing the likelihood that a reader would be willing to share our content. At this point, they’ve already read the title and the intro and liked them enough to continue reading. Click-to-tweet’s should not be the only call-to-actions (CTAs) you add to your content. The difference between blogging and content marketing is that with the latter you want people to do something after reading your (helpful) content. It can be something as simple as asking readers to leave a comment (we often do it in the last paragraph of the blog post). We have two general aims with our content; to get people to subscribe to our email list and to get them to start a 14-day trial of Hubstaff. All of our content asks readers to perform one of these two goals, depending on what audience each piece of content is aimed at. My last piece of advice in this section is: be careful with the CTAs you use. You should have at least one, but if you have too many, the effect would most likely be negative. While we’re on the topic of CTAs, I would like to also mention UTM links. Most popular services like the abovementioned OptinMonster & Hellobar have at least some form of analytics and statistics to give you insight into the success of the marketing assets you’re using on your sites. However, I find UTM links to be really powerful yet easy to use (even for someone non-technical like me). They give us a ton of data about how our content affects trial signups, email subscriptions, etc. Buffer has an extensive resource on how to get started with using UTM links. The images, screenshots, graphics, and other visual content we use to complement our written content is really important to the success of our content. That’s why we have a set of rules that govern their use. The first thing is to select the visuals that will complement our content. We avoid stock photos because we find them to be really soulless. Every once in a while we’ll make an exception and complement a post with an image from a site such as Pexels or similar, but only if there’s a good combination between the quality of the photo and how well it fits the topic of the post. Often, we add a homepage screenshot or logo of a service/tool we mention in the article. However, the visual that works best is the one that truly complements the flow of the post and helps the reader achieve their goals. That usually means screenshots from the interface of the tools we mention and/or graphics. The load speed of your site is important for the success of your content and images play an important role in the success (or failure) in that area. We resize all images to be max 850px long. This is the max length content visualizes on the blog, so having an image larger than that is useless as it will get resized to fit this anyways. We optimize images using one of the following free apps. Doing this decreases file size by an average of 25 percent. A few months ago we dedicated to creating great header images for our blog posts because we believe they really add to the overall feeling of quality of content. In the past, some of the visuals we’ve used and the lack of a good leading image did a disservice to our content. That is why we have a dedicated graphic artist working on header images. It is important to work with the same person consistently and establish your style because your header images will also serve as a brand tool. Once your readers see them around the internet, they will know it’s your content. Step 11: Do you really need a conclusion to your blog post? The readers who reach this part of your article are truly engaged with your content. That makes the latter bullet above really important because they are also the most likely to follow what you ask them to do. Use this opportunity wisely and focus on getting them to do 1 thing you’re most interested in. For us, this usually varies depending on the place of each particular post in the overall strategy. On most posts we ask readers to check out a related post or leave a comment, but if the post they’re reading is aimed at people who are considering a purchase, then we’ll make sure to ask them to start a Hubstaff trial in the conclusion. I focus on getting a great SEO title and meta description. These two features of your article are really important to your performance on search engines, as they are what people see first. There’s plenty of evidence that Google is using clickthrough rate (CTR) as one of the ranking factors, making them even more important. The more enticing your SEO title and description are, the higher your content will rank (and vice versa). Finally, I look at the “Content Analysis” section and try to get as many green dots as possible. I really like using this feature as a checklist to make sure I don’t forget anything important like alt tags on images (yes, they matter). However, it is really important to point out that we do not over-optimize our content. We would prefer to have an article that reads naturally and exudes quality, rather than a text that feels like it’s been written by a machine. We go through all these features for every piece of content that gets published on our blog. We feel this is the only adequate guarantee that we publish quality work every time. I hope that you’ve been able to pick up a few ideas for your own content marketing efforts as well. Don’t forget to download the checklist file that goes along with this and to use it in for your next blog post. I’d also be really happy if you could share some of your own advice and tips on how to edit and publish great content. Ilia oversees the blog as part of his job as Hubstaff's content marketing lead. When not obsessing over words here, he likes to work on other things that can make the lives of Hubstaff customers easier.